Moving costs money but it is up to homeowners how much they will spend on this endeavor. It doesn’t have to be the most expensive thing that people ever do in their lives. If they do the entire thing themselves or share the duties with a moving company, moving can be surprisingly affordable. The less people need to pack and carry with them from an old house to a new one, the better. Especially if people are downsizing, they will want to eliminate several belongings so that they don’t have to pay to move them when they are not likely to need them in the next house. More than making it less costly to move, this strategy will help them put money in their pockets. Movers can purchase all of the boxes and packing supplies they need but this is an unnecessary expense. They can save this money if they plan in advance and ask their local grocery stores for their boxes. This way, they will receive several intact boxes that would have been sent to the recycling center. They save the grocery store employees the hassle of having to break these boxes down, so they will be grateful to be rid of them. Packing supplies for purchase that movers use to cover their furniture and their breakables are also not required during a move. Homeowners always have old towels, sheets and blankets lying around that they can put to good use as furniture covers. Newspaper is also instrumental in wrapping up dishes, glasses and other things that can be broken during a move and it is already available. Homeowners can outsource all of the moving duties to moving companies but they will need to pay for this service. If saving money is their goal, they can do these things themselves. After they obtain the supplies without cost, they can begin to pack their things on their own. The best way to handle this duty is to start well in advance of moving day so that they have plenty of time to complete the process before they are required to be out of their houses. Starting early will also have the effect of reducing their stress levels that tend to be high when people are moving. Movers may know someone with a large truck they can use rather than hiring the moving company or renting a truck. It can be difficult asking for help from family and friends but homeowners can make it easier for them to agree to be of service. They will want to make sure that their friends do not feel taken advantage of, so they will need to have plenty of refreshments on moving day. Also, they will want to have enough help from family and friends so that no one will feel overwhelmed with all of the work there is to do. Even if there isn’t anyone who owns a large vehicle that can assist them in their moving duties, homeowners will be able to rent a truck from a company that will be less costly than hiring the moving company. They may still need some help moving their furniture and their other belongings but they can take care of their helpers in the manner described above in this situation. Sometimes, it’s not possible for people to do everything themselves. These movers do not have to think that they will have to pay the highest prices when hiring a moving company. They can save money in this area too if they take the time to make the necessary preparations. For example, movers have several moving companies that are going to need to compete for their business. They can make these companies offer their best prices for their services by asking for an estimate from more than one company. After choosing a company, movers will want to make things as easy for them as possible. Movers are paid for their time and homeowners who do not make the job any more difficult than it needs to be will save their movers time and themselves money. If everything they need to move to the next house is set aside for them when they arrive, the movers will be able to take everything to the truck promptly and proceed to the next location. Author Bio: Becky Harris writes for Upack abf portable storage containers for customers with businesses on the go. 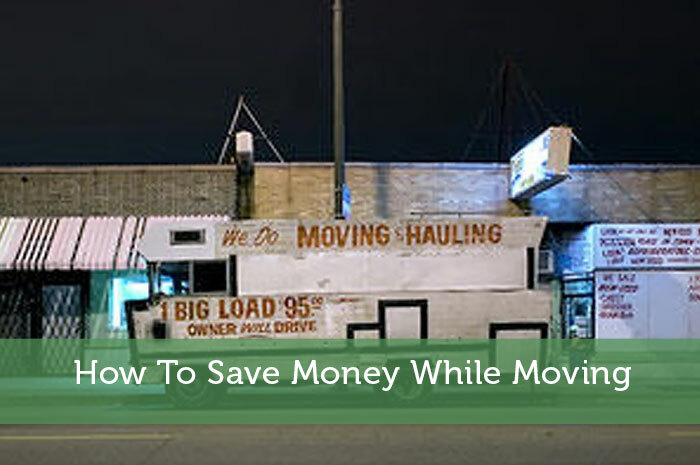 What kind of strategies to you find to be most useful for saving money while moving? Editor’s Note: I have been having some problems commenting on blogs, even my own. So please bear with me while I resolve that problem. Thanks! I definitely saved a fortune by hiring a van and doing the actual moving myself, however it was HARD work!!! V exhausting!! Tell me about it. Ironically I just helped a friend move yesterday. My muscles are a little sore after not using some of those in a while. That’s where some helpful friends pay off big. This post is awesome. I’m moving cross country and I was stressing about getting moving supplies. A lot of people listed their extra boxes for free on Craiglist, but that’s shady. I will definitely be banging down the door of my grocery store. For your cross country move, I’d actually make a point of getting quality boxes. Usually the typical move is just across town and hiding the box’s contents is less important. The craigslist boxes are probably legit. Just ask to meet them in a public place or bring a guy friend along. I always move myself…with a little help from my friends! I go to grocery stores for boxes, too. 🙂 I’ve rented trucks in the past, but used them to move myself. You have to do the math to figure out which one is most cost efficient. Great tips. I almost always move things myself and with friends, but I have hired a mover to help before. For a tricky move, it can be incredibly useful. They know all the tricks to getting around corners and doing everything efficiently. Sometimes the price isn’t too much more than renting the van yourself. I don’t think I could leave it to a business to pack for me. It just doesn’t sit right – I mean I get it though. Great post and I really like the Garage Sale idea. Especially with social media and places like Craigslist if you put a little effort in you can definitely make a few bucks on stuff you didn’t want to take with you. Moving can be a huge money pit though so having a plan and a post like this is a great start. It does take a huge amount of trust to let someone pack your stuff. It would just be too easy for them to pocket something or just not properly protect things. Plus you just wouldn’t want them digging through your personal possessions. It would just be weird. Even if I hire someone to help move, I make sure to do all my packing myself. Just don’t be like my sister and ask your friends and family to do all of the heavy moving for free in exchange for a pizza party. Sorry, we’re 32 years old so a pizza party just hasn’t been all that appealing to me since I was like…..12. Also, we aren’t in college anymore. It’s not like she was asking us to move some old crusty dressers, a bed frame, and a mini fridge. She has a whole house of furniture to move. Ugh. Sounds like your sister needs to learn to be a bit more appreciative. It actually sounds like my ex’s sister too. She’d basically brag that she doesn’t have to do any work during a move because her friends are so willing to help. I don’t know if she realizes how much it makes it look like she’s just using her friends. I wouldn’t want to be friends with someone like that. It really does help to get free supplies – boxes are almost always available on Craigslist for example. $200 is not bad for moving. That sounds like about how much I would spend on times when we didn’t hire a mover to help out. As long as you have some good friends to help out, there isn’t much reason to spend more than that on a local move. When my wife and I moved into our house we didn’t pay a thing for moving. My dad works at a warehouse and can get tons of boxes, and I would take the empty paper boxes from work. We did all our own packing and labeling. We used my parent’s van and my in-laws’ truck and did everything ourselves. It was work, but I don’t mind doing that sort of thing. Once I get a bit older I may not feel the same way, though. Wow to move without spending anything is awesome. Having access to a truck or van saves a lot of money. It can add extra work when you have to make multiple small trips though. I do like the convenience of filling up one moving truck and unloading it all on the other end. I know a friend who made money off of their boxes once they moved. They were very careful with them, breaking them down and whatnot, then resold them on craigslist, along with the other packing materials they had acquired (mattress bags and such). Empty paper boxes from work are also awesome! We use a bunch for storage, especially as they stack so nicely by being uniform. Yeah if you’re going pay money for boxes, you might as well try to resell them. Personally I just go for the free ones from the start. I don’t think anyone is going to want to buy my used banana boxes and liquor boxes. Sounds like you got stuck with the lousy work Michelle. I’d rather be sore the next day than have to do the cleaning and sorting. That’s what you get for being all pregnant lol. I’m sure you won’t have to move for a long time now. That’s one bonus of buying a home. I’ve always been down for moving myself, but after moving 6 times in 6 years I’ve gotten sick of it. If we sell our house I’ll definitely take some time to contact a moving company and get a few quotes. While I’d love to be able to pay somebody, it will ultimately come down to how much they want to charge. We’ve already had a garage sale and will pack up everything ourselves and have it in the garage ready to go. I’m hoping to get a reasonable price…maybe $350 or so. If I can get it for that amount then I’m all for paying somebody else! I know the feeling. After a bunch of moves, you just don’t want to deal with all that crap yet again. That’s why I eventually started hiring a moving guy to help. Last time I was tight for money though. So I ended up doing it on my own with some friends to help. Earlier in the week I had also helped my ex move, which made for some sore muscles that week. We have done all of these things when we have moved in the past. It really helps to get vehicles from family and their muscles. Friends often manage to find something else that they forgot they had planned that day. Now I’ve got friends with trucks though. So they might feel more obligated to help out. I’ve saved money on several moves but doing the moving myself instead of hiring movers. Most recently my fiance’s coworkers helped us out so we bought them lunch as a thank you – still much cheaper than hiring movers and we all actually had some fun with it. If you can get enough people to help out it goes so much quicker too. It’s that much less stuff each person has to carry. My friend moving this week is kind of doing that approach, but he’s been spreading that out over several days with different people coming each day. I think he’ll have to end up spending a lot more on beer & food that way. I would definitely try to do the move myself to save some money. I know a couple of local stores where I could get all the boxes I would ever need for free, plus my dad owns a couple trucks, so I would be set. That sounds perfect. To have a couple trucks readily available would make things go so much smoother. Just using a single truck can be rather time consuming since you can only move so much each trip. I pretty much rock moving at this point. I moved 12 times in 10 years, and helped a dozen others move as well. Our last move, we packed up EVERYTHING except our dog in a box and labeled it all for where it was supposed to go in the new place. We got free, quality boxes and bubble wrap from my wife’s work. Our church group of about 10 people showed up to help, and we got a free moving truck from our real estate agent. From the time they showed up to fully unloaded at the new house (20 miles away) it took 3 hours. Damn 3 hours for a full move is impressive. Next time I move I’ll have to call up your church group lol. Then again, I don’t want to help them all move later. So I guess I’ll stick with local help. Properly labeled boxes would help a lot when there’s that many people involved. No more of the ‘where does this go’ type questions. I never would’ve guest the first suggestion be to have a Garage Sale. Awesome idea though! Moving always brings out the “junk”. But one mans junk is another mans treasure! Personally I’m usually too busy before a move to be able to organize a garage sale. I do try to sell some bigger stuff on craigslist and donate a bunch of stuff. It at leas makes the move a little easier. Actually, I used ABF when I moved out to Colorado. Renting a Uhaul truck to take everything to and from the terminals, plus 7 linear feet in a trailer was by far the cheapest option I was able to come up with, especially since I had drive my car out there too! A great place to get free boxes is the grocery store. Either show up around the time they do their stocking, or ask if a clerk can set some aside for you. Many won’t, but if they won’t they will usually tell you the best time to try to grab some before they get compacted. Yup I totally rely on grocery store boxes for moving. There are enough grocery stores around here, that it is easy enough to hit up more than one if you don’t time it with their stocking. They’ll usually have at least a few boxes to give you. With all the sources for free boxes, I would only ever buy boxes if I was doing a long distance move that required sending boxes by plane. I think that it’s all about the network. I’ve helped friends and family move many times, turning what could be a difficult task into a great social event/party! And when you all work together for free, nobody pays income tax on that. Thanks for sharing your thoughts. It is definitely easier the more people get involved. Instead of it seeming like a ton of work it turns into an exciting time. I’ll have to see how many people I can convince to help out when I move in the near future. We always try to minimize the amount of things we move. We quit grocery shopping about a month before we move to eat everything so we don’t have to move food. Good tip Lance. I usually try to do this. Suddenly you’re trying to find ways to use all of those non-perishables that have been sitting in the cupboards for months. The more you can use up the better. Doing things on your own will save you quite a bit of cash, but sometimes you do need to take into the account the cost of the time you are investing into the move. Is the price of your time investment cheaper than the cost of hiring a reliable and reasonably priced company? Sometimes the answer is no, but that’s definitely something to consider. In my case I would make more than enough to cover the cost of movers by working the day instead, but I’d still prefer to be there to oversee. So that really negates the time factor. even before talking with a mover, decide in advance which goods will be shipped and which will be sold or given away. Then consider whether or not you would like the mover to pack and what other type of additional services you may want. Remember that packing is always a separate bid from moving. An estimator may come to your home and create a bid, or make an estimate by talking to you over the phone. Moves that are less than 50 miles away are usually priced by the hour. For longer distance moves, estimates are based on weight, usually per 100 pounds. Well, I didnt know they charge seperately for the packing and the move. I thought it was all-in-one package! The price does seem slightly steep but I suppose it comes with convenience and some peace of mind! It is not a good choice to hire the movers which are very cheap than usual. They may be scam. I have seen a lot of reviews like that over the internet. I think then it boils down to doing your research beforehand on the movers you wish to engage for the move and get recommendations and referrals from people who have used their services in the past. This way you can at least have a modicum of peace and assurance that you are getting a good, honest deal. We recently moved from Chicago to Seattle and boy was it an adventure. After researching full-service movers we decided it was too expensive and there wasn’t enough assurance/trust that our stuff would arrive on the day we needed it to. I ended up renting from Penske and buying boxes from U-Haul and packed the 26 foot truck myself. I also towed our SUV behind. Getting up those mountain passes sure was a struggle for that truck. Next time I’m ponying up for a mover no matter what.